With a black dial, contrasting red seconds hand and a tachymeter, the Mühle-Glashütte Teutonia Sport I becomes this German brand’s first truly sporty model within its previously casual/dress Teutonia collection. The new watch, a preview of Mühle-Glashütte’s 2017 Baselworld debuts, underscores the brand’s ability to create functional watches with distinctive designs, most of which also notably feature a healthy dose of customized base-caliber enhancement. 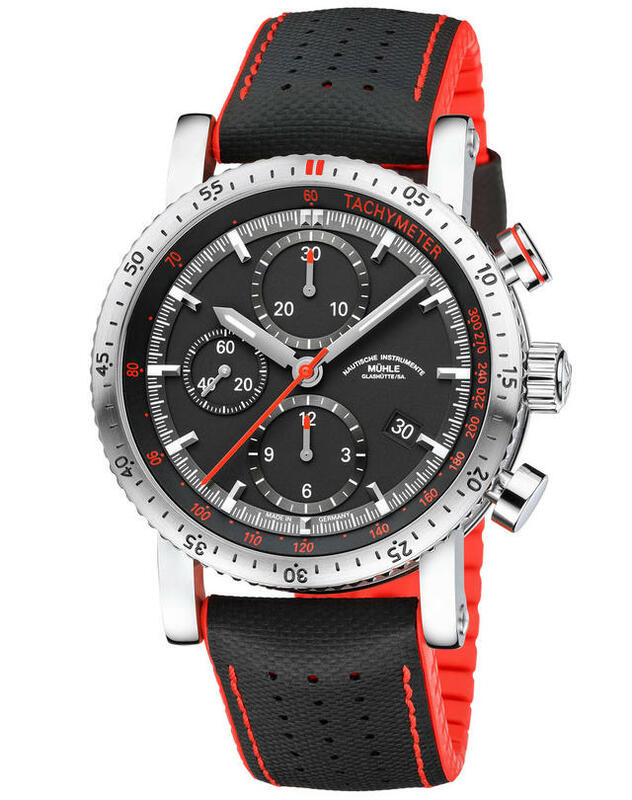 The Teutonia Sport I is a 42.6mm steel-cased chronograph with three light-grey-edged subdials that allow them to stand out quite visibly against the dark dial. Mühle-Glashütte enhances the sportiness of this layout and dial display by surrounding it with the aforementioned tachymeter, clearly marked with red-tinged markers and numerals. 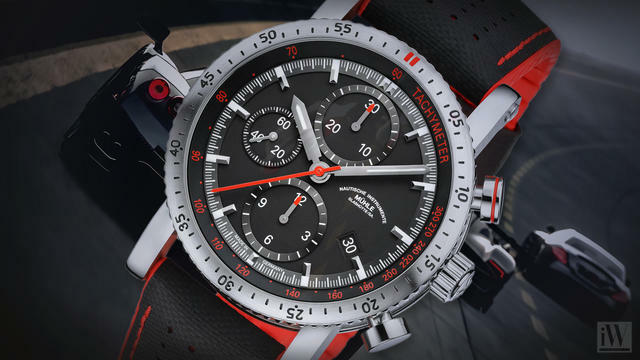 The tachymeter allows the wearer to calculate speed over a distance of 1,000 meters at a glance. As is always the case with Mühle-Glashütte watches, the caliber here receives a customized –and patented – in-house developed woodpecker neck regulation, a Glashütte three-quarter plate, a special rotor embellishment and characteristic Glashütte surface finishes. Hence, for this watch Mühle-Glashütte transforms the Sellita SW 500 base chronograph movement to create MU 9413. Mühle-Glashütte notes that all its watches meet German chronometer standards, but with a specialized flourish: Mühle-Glashütte regulates its calibers so that they are always slightly fast and maintain a precision of between 0 and a maximum of +8 seconds per day. Why? “This enables us to ensure that Mühle watch wearers are never too late because of their time measuring instruments,” the company explains in its product literature. 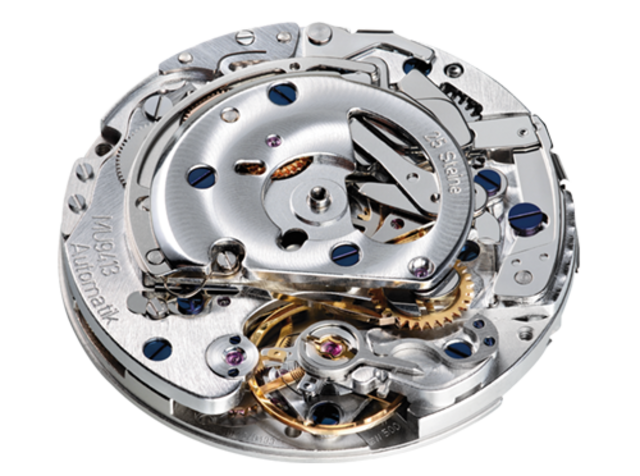 Movement: MU 9413, automatic (Base Sellita SW500) with patented woodpecker neck regulation, Glashütte three-quarter plate, own rotor and characteristic surface finishes. Stop-second, fast date correction and 48-hour power reserve. Case: 42.6mm by15.5mm brushed/polished stainless steel. bi-directional bezel, domed and double anti-glare sapphire crystal, transparent case back, screw-in crown. Water-resistant to 100 meters. Strap: Waterproof leather/rubber strap with a stainless steel pin buckle. Screwed strap attachment bridges. Dial: Black with applied indices; hour indices and hands coated in Super LumiNova. Founded in 1869 in Glashutte, the company initially manufactured precision measuring instruments for the local watch industry and the watchmakers’ school, making an important contribution to Glashutte’s good reputation as the center of the German watchmaking industry. The wristwatches produced today stand out due to their clarity of display, functionality and high precision. Muhle Glashutte has been devoted to accurate measurement for over 140 years, and has been focusing on nautical instruments, marine chronometers and mechanical wristwatches since 1994.